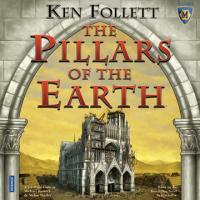 For you “Pillars” Fans, there is now even a board game based on Follett’s best selling novel. You can become part of the Kingsbridge magic as you attempt to build the most beautiful Cathedral in England. Your building/ strategy skills will be tested as you encounter all kinds of obstacles along the way. Perhaps The Pillars Of The Earth Game will become the new Monopoly! The Pillars Of The Earth mini series premiers tonight at 10 on Starz! I just borrowed this book and really enjoyed all 900 pages but I can not imagine a game about it. That sounds so difficult, I almost could not wait for their ordeals to finally end!